In Allen Eskens’ novels, Minnesota is a dark, violent place. His recurring characters routinely wrestle with loss, loneliness and loathing as they work their way through the carefully plotted mayhem imagined by the lawyer turned mystery writer. 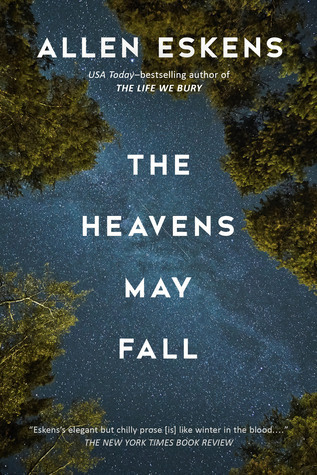 Eskens’ third book, “The Heavens May Fall,” is not exactly part of a trilogy, but it does follow a familiar pattern with familiar names. Minneapolis detective Max Rupert, who appeared as a stoic hero in Eskens’ first two offerings, tries to solve a grisly murder in a Kenwood mansion. He continues to grieve guiltily for not protecting his wife, killed in an unsolved hit-and-run four years before. Rupert’s brother, a fellow cop, has also died, and his best friend, lawyer Boady Sanden, has betrayed him by ably defending the prime suspect in the Kenwood case. Lila Nash, a young law student whose life Rupert once saved, is helping Sanden. Everyone is sort of damaged goods. Rupert drifts toward self-destructive isolation. Sanden has quit practicing law because he screwed up the case of an innocent young man who then was murdered in prison. Lila, featured in Eskens’ first novel, “The Life We Bury,” bears physical scars from a savage beating where she was nearly raped and murdered.